Here's my card for July's first Viva la Verve sketch. It's been a while since I inked up Verve's Hip Hop Bunnies stamp set, so I pulled it out to use for the sketch. Those bunnies aren't just for Easter, you know! I colored one of the bunnies using Copic markers, then used the matching die from the Bunny Hop set to cut out the colored image. 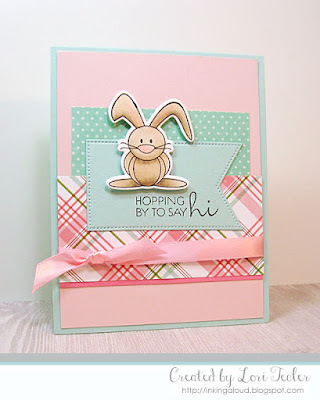 I paired the bunny with a pair of coordinating patterned paper scraps--one dotted and one plaid. The patterned panels were adhered to a pale pink cardstock panel. 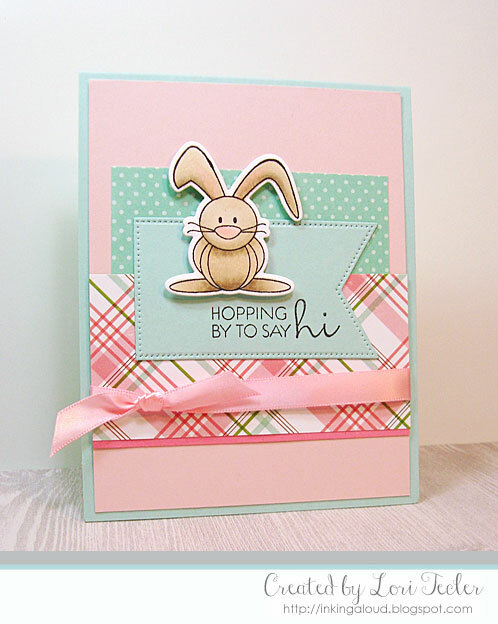 I stamped the "hopping by to say hi" sentiment on an aqua fishtail flag die cut and added that over the panels. The bunny was set on top using foam tape for dimension. After wrapping the pink panel with a bit of pink satin ribbon and securing it with a simple knot, I adhered the panel to an aqua card base. This is just adorable! He's colored so sweetly. Gorgeous card Lori! I love the pp you used! I love your sweet bunny card. The colour combo is divine.